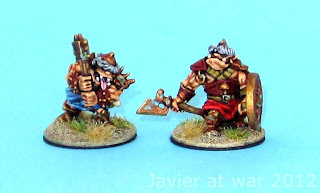 Two weeks ago I saw on the excellent blog Tiny Solitary Soldiers a post about a new ruleset called Combat Cards. As I read it I instantly got interested as the ruleset had a different approach: gaming cards with no dice and generic enough to represent different periods and scales; so I thought of Hordes of the Things for modern combat, and I bought, printed, read and played it. For my first game I used my Epic forces as I could easily deploy all types of units in the game. 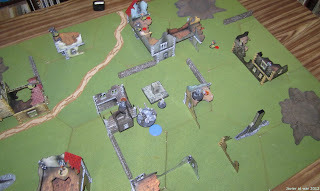 We played a standard 36 points game which lasted more than three hours! and it was very disappointing. Firstly, it took too long to play a game, taking into account it is simple, and generic and plays with so few units per side. In the second place, the game was terribly static as there were very few opportunities to move your units and then they moved very slowly; 5 cms. most of the time (very short distance halved because of terrain). 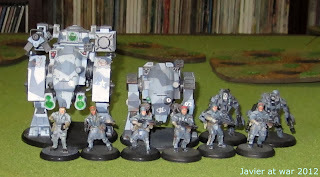 My Marine forces consisted in one recon on the left, four mechanised and one command in the center, one tank at the back and off board artillery and aerial. 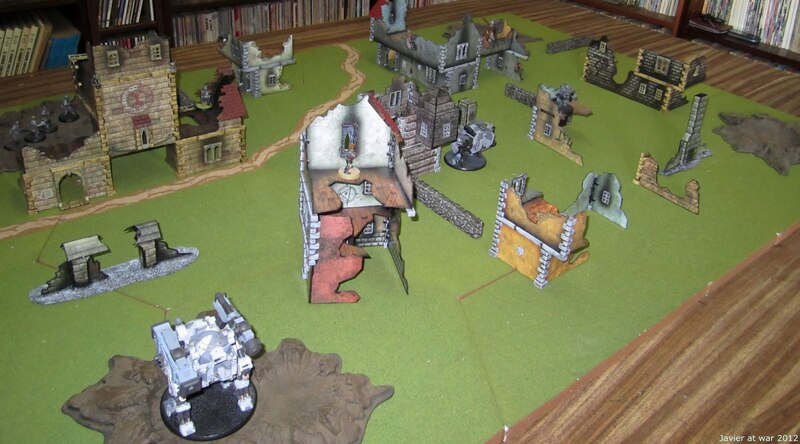 The Orks with similar forces in the cover of the wood and top of the hill. 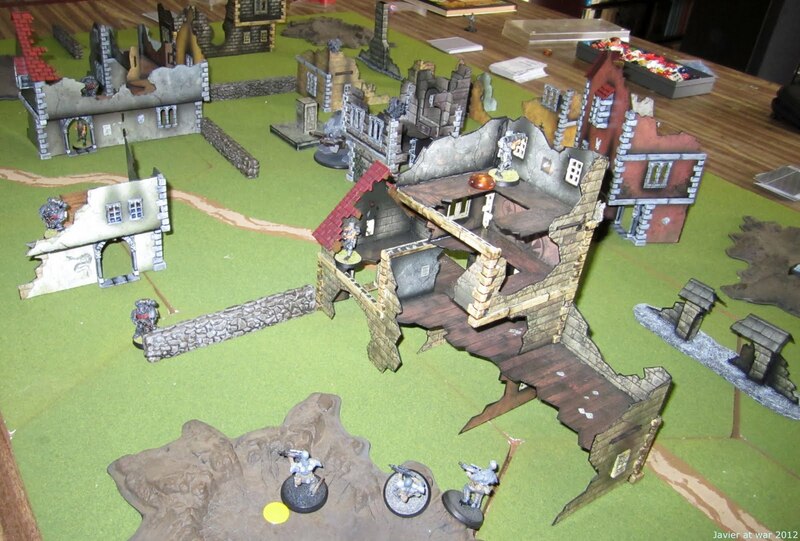 Although the game works in any scale, it felt odd to play with a dozen tiny stands per side on such a big table. 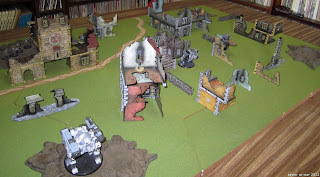 And here a picture of the last turn of the game, three hours later. As you see the units hardly moved. After this fiasco I could not understand how this guy from Mac's little friends could have such enjoyable games with Combat Cards. So we thought the Epic scale did not help and that for our next game we would add much more terrain to avoid long fire lines. We also thought that we spent a lot of time reading and understanding the cards as we are non native English speakers, and that in our next game that won't be an issue as we already knew the effects of the cards just by reading their title. Decided to give the system another opportunity (especially after spending on it 10 dollars plus 8 euros more for printing the cards and ruleset), I wrote three times to the authors with doubts we had during our first game and I have to say that they answered on the three occasions within 24 hours and in a very friendly and helpful way. So next weekend we planned to play two consecutive games. The first one would be a la Infinity, using 28 mm. miniatures in a bombed and ruined city; and the second one would be the free scenario number six, set during WWII. 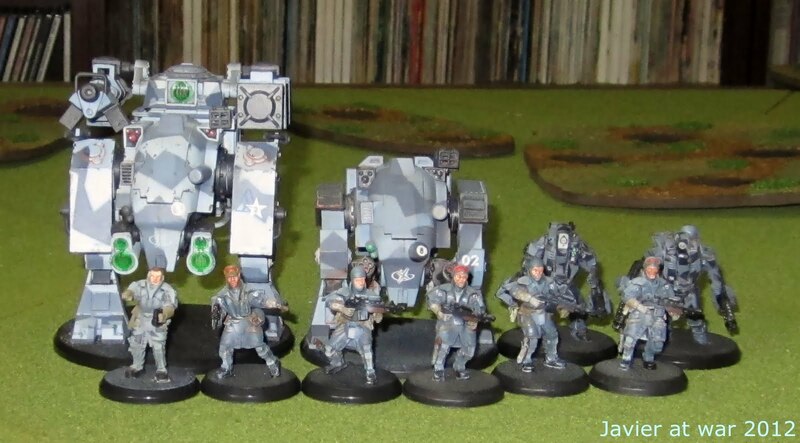 For this second game my force, from left to right, consisted of one recon, three mechanised, one command, three infantry, one anti armour and one heavy weapon plus two aerial units and one infiltrator not in the picture. My buddy chose one behemoth, one armour, two mechanised, two commands and four infantry plus artillery and aerial. First turn. Most of my forces at the bottom of the pictures, inside the two main buildings. 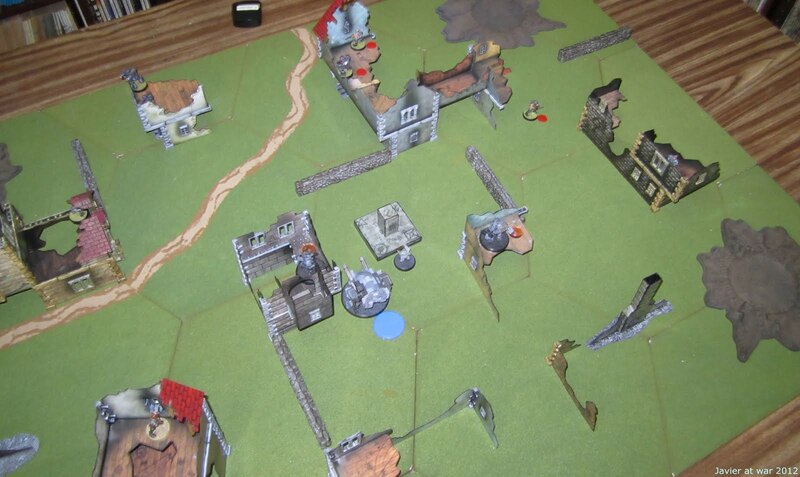 In the first turns my buddy put some of my units out of action with aerial and artillery attacks. After that I decimated his infantry units with my mechanised ones. As the rules says, we finished the game after one hour and a half and I won for a couple of points more. Although the scale was more appropriate and we knew the content of the cards and had some experience from our previous game, still it was very slow, especially when moving or doing things with troops. Most of the units never moved, and only a few fired excepting artillery and aerials. An infantry unit had to spend at least three move orders to go from one cover to another; actually only my mechanised units managed to complete the move from one place to another. We were already quite demoralised about this ruleset but nonetheless we tried a second game, one designed by Tactical Assault Games to be specifically played with this ruleset. So we set the game board and chose our forces. My Germans playing as Russians and my Buddy's Americans as Germans as we did not have the exact forces for that scenario. The Americans on the left had three tanks, one command, one recon and two infiltrators plus artillery and aerials off board. The Germans on the right had deployed in the woods one bunker, one aerial defense, one command, one anti- armour, one infantry and one fire support (a mortar), plus two more infantry squads in the forest ahead and one artillery and one aerial off board. The Americans decided to dig in and then hide in the open and in front of the Germans and then start pounding their positions, whereas the Germans tried to flank the enemy tanks with their infantry. Soon my units started to accumulate shaken, fall back and out of fight counters. Then I lost my artillery in a counter strike, but luckily my infiltrator killed the American command and later I had the pleasure of killing one tank with my infantry shooting at its back. In any case, the game was again very static and luck dependant, and soon we got bored and started to look at the watch to check if the reglamentary hour and a half had already passed. This time I lost for a point. After these two games we still have the same bad feelings about this ruleset. It is simple and generic yet it takes the same time to play than any other more complex and more challenging and rewarding game. Hordes of the Things for example is generic and it plays with a dozen or so units, but the game lasts about half an hour and it is much much more strategic, fast and fun than Combat Cards. We never experienced that Aha! moment that Mike comments about Combat Cards; he enjoyed it a lot as other gamers do, so maybe it is us who are wrong. All I know is that this is the first time I wrote such a negative review of a game and that I won't play CC again. Actually they are Orcs from the Magister Militum's 15 mm Blood Dawn range, but I gave them flesh tones to use them as Ogres for my 10 mm skirmishers. It is the first time I try to paint bronze rust but I think it turned out okay. 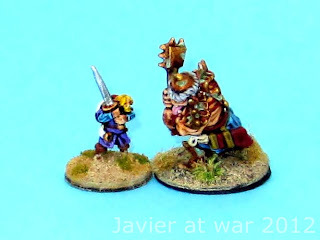 Here you can see one of them next to a Copplestone's 10 mm figure. 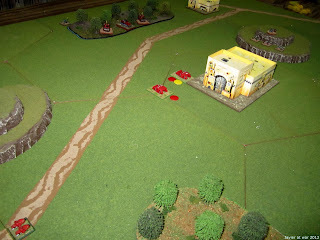 This Sunday we played our first game of 2012 and second of SAGA with 6 points armies. 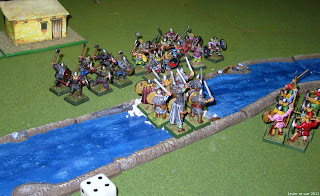 Me with Vikings and my buddy with his Foundry Vikings as Anglo Danish in the upper part of the river. We both got victory points per warriors crossing the fords to the other side of the river in seven turns. The big six sided die is marking the turn number two, and we can see how the forces are approaching to the fords. 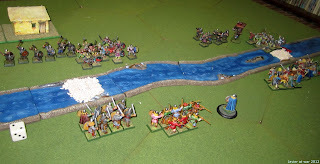 On turn three the Danes tried to pass through the right ford but they were rejected by my Vikings though they ended very tired due to the melee and the Danish exhaustion order. On turn fourth I tried to charge through the left ford but the enemy used my fatigue marker to shorten my moving distance, stopping me before the clash. On the following turns the Dane Huscarls charged my Hirdmen in the ford and died all my eight men and six of his! ; whereas in the right ford his leader charged side by side with his two handed axemen unit and slaughtered my unit of bondi. 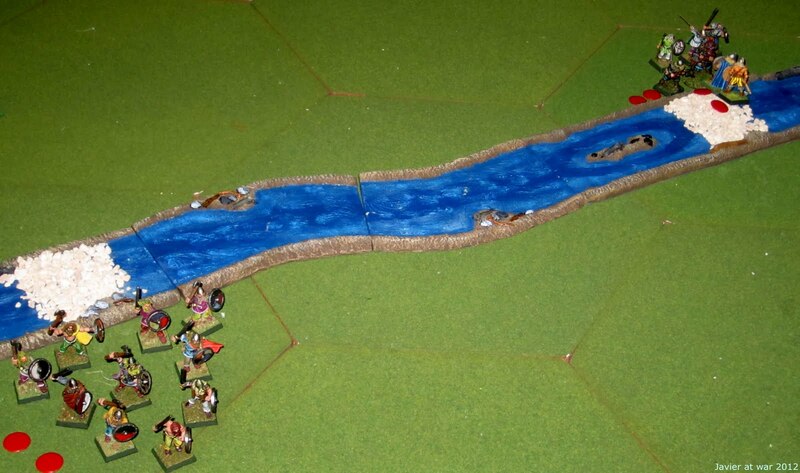 My bondi on the left tried to hold the ford but in the last turn they were massacred and the Danes got pass with a second activation. 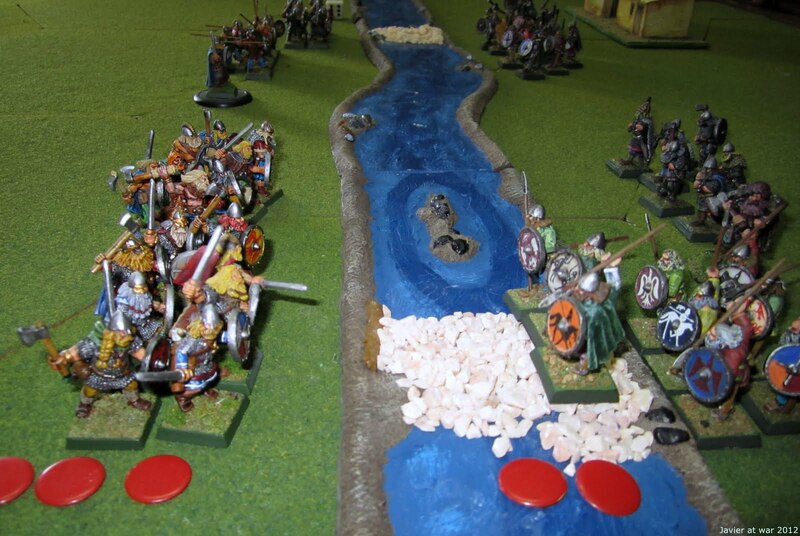 On the right ford it only remained my heroic leader and one following bondi holding the ford, and the Dane leader and half of his ceorls with all the huscarls dead, after both leader being fighting for three consecutive turns. My opponent managed to squeeze five victory points in the very last turn of the game.